A cloud based GDPR compliant CRM system with unified communication including calls, texts and emails. After the GDPR comes into force in May 2018 your business will need to become compliant if you hold personal data on individuals in any form. Personal Data includes anything from a name, a home address, a photo, an email address, bank details, posts on social networking websites, medical information, or a computer’s IP address. You can no longer hold the personal data of individuals unless you have gained their consent lawfully. As a business you need to document how you comply with GDPR. You must also be able to report data breaches within 72 hours and maintain overall data privacy and security. Your business will need an electronic a data management system (Smart CRM) that manages and records all customer communication including emails, texts and phone calls, as well as correct consent at each point in the customers journey. A complete history is automatically maintained thereby ensuring a complete and effective audit trail. Additionally management controls of data held can help you avoid data breaches, by organising how data is accessed among your team and at what level. Simple Data Safe offers the one stop solution to all your Data Protection needs and is the latest enterprise business software from Market Visibility. The system is easy to use with simple screens that allow you to send emails and texts broadcasts at the touch of a button. Then take customer consent and the details stored in the unique customer history. By understanding the implications of General Data Protection Regulation has allowed us to design a system with simple steps to communicate and gain consent within your retail touch points. 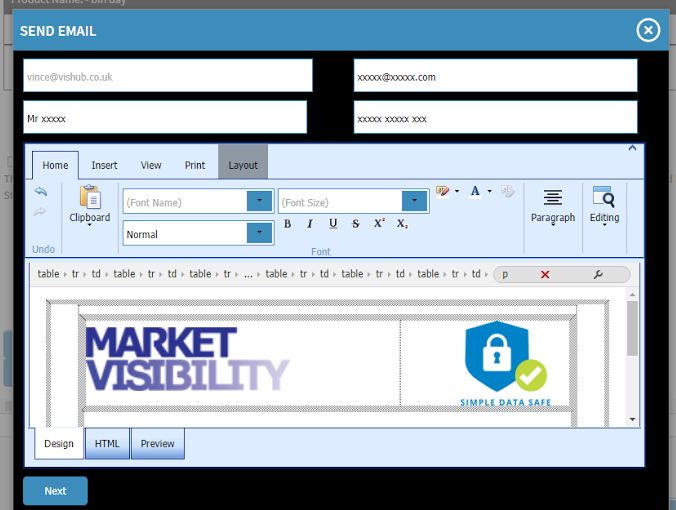 By creating email response that match specific consents and scopes of data you can respond without the risk of breaking the regulation.You can simply create a new email template or edit an existing email template with ease using our HTML editor and schedule a bulk broadcast. That’s how simple it is. You just need to setup the schedule and relax. The system then takes control and actually sends the emails and records the actions in system history. The system prepares management reports and tracks how many opens and unsubscribes on your email broadcasts.